Carles Puyol i Saforcada (born April 13, 1978 in La Pobla de Segur, Catalonia, Spain) is a Spanish/Catalan footballer who is the current team captain of FC Barcelona. He is a regular in the Spanish national team. Puyol played for Spain at the 2000 Olympics, 2002 FIFA World Cup, Euro 2004 and the 2006 FIFA World Cup; Puyol has been capped over 60 times. He has also played for the unofficial Catalonia national football team in one friendly. He went to FC Barcelona B at age 17 in 1996 and in 1999 Coach Louis van Gaal put him into the first team and his debut came on October 2, 1999 against Valladolid, a game FC Barcelona won 0-2. He started as a regular for Barcelona in the right back position but has since converted to center-back. He was first chosen as the captain for Barcelona in the 2003-04 season. Puyol has also been called upon to captain the Spanish national team. May 17, 2006: Barcelona, with Puyol as captain, won the UEFA Champions League, defeating Arsenal FC 2-1 in the final and became the first Catalan captain to raise the UEFA Champions League Trophy. He was awarded "Best Right-Back in Europe" by UEFA in 2002. He is currently under contract with Barcelona FC till June 30, 2010. 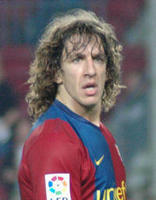 Puyol was awarded the title of UEFA Champions League Defender of the Year 2005-06 on Thursday 24th August 2006. Puyol is a tough, aggressive defender who has the versatility to play both as a full-back and in the centre. His holistic approach makes him a favourite at his club side, Barcelona. Puyol is a vital member of Barcelona coach Frank Rijkaard's team, and his tactical ability and know-how also means he is not a man to pick up many yellow cards or, indeed, injuries, both of which factors have meant that he is an ever present in both Europe and domestic competition. His attacking mentality is a result of him playing as a striker in the early years in his boyhood club La Pobla de Segur, after injury problems with his shoulders forced him from his original position of goalkeeper. His energy and athleticism is vital in defense, for the high backline, attacking style that Barca plays.